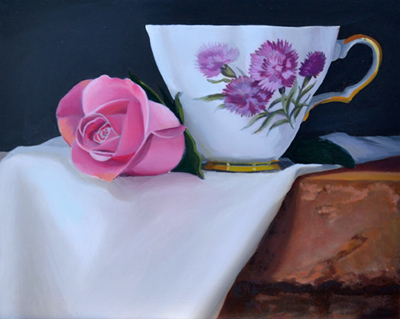 On my easel right now is a 8″ by 10″ Still Life Oil Painting of a pink rose and a teacup. I am probably about 3/4 done with this original painting. This painting has nice contrast from the dark background to the lighter objects in front. There is texture from the brick shelf and then the contrasting white drapery that the objects are sitting on. The detail on the teacup has taken some time and I still have work to do on the rose. Check back to see the finished oil painting. Hopefully in the next couple weeks.